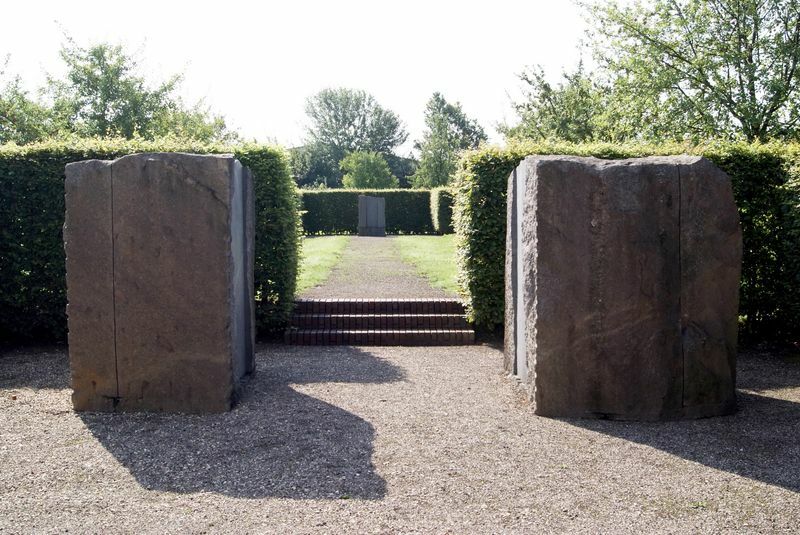 Ulrich Rückriem’s first opportunity to design a landscape for his sculptures arose when the outside areas at Sinsteden were being planned and realised from 1993 onwards. Prior to the construction of the exhibition halls, these outside areas had primarily been used for agricultural purposes. Various sections were created, which were finished in temporal succession and added to each other consecutively: the first, which is strictly symmetrical and includes sculptures, is located between the exhibition halls and the farm buildings of the agricultural museum; the second was created at a later date and resembles a forest edge; and finally there is the meadow orchard. Two collections which could not be more unalike make up the Sinsteden Cultural Centre in the district of Rhein-Kreis Neuss. They are the Skulpturen – Hallen Ulrich Rückriem (Ulrich Rückriem Sculpture Halls) on the one hand, and the agricultural museum with its five-hectares of land on the other. The complex presents various aspects of landscape design which include both art and agriculture, and it is this combination which links between both institutions. Sculptures can be installed indoors, but they can also be placed outdoors, a practice which Ulrich Rückriem has been implementing from the time he started working as a sculptor. Just as with his concept of art for indoor spaces, the outdoors sculptures exist in relation to an already-existing environment, which can be a building, a location or a landscape. In contrast to the interior backdrop, which is kept as neutral as possible, Rückriem seeks conscious dialogue with nature when working outside, thereby creating a connection which is of equal value. At the beginning of the 1980s, Rückriem turned his attention to garden design and landscape planning when working on his installations and searching for new possibilities. This was followed by first attempts to embed his sculptures in already-existing landscapes. The first large-scale project was Zeche Zollverein in Essen. This was followed by plans for Turin in 1995/1996 and Paris in 1996/1997, but these were never realised. Further projects followed. The centre of the symmetrical section is taken up by an area of lawn surrounded by hornbeam hedges as well as flowerbeds planted with trees, ivy and laurel. Rückriem consciously decided against using flowers or flowering shrubs which would have provided colour. Two paths which meet at right angles were constructed parallel to the exhibition halls and this planted area. The path in front of the smaller hall leads to the rest of the site and is flanked by two sculptures positioned opposite each other. The ground behind them is slightly raised and draws attention to a third sculpture standing a short distance away. Two rows of fruit trees along the path simultaneously create a link to this sculpture and complete the composition. A further hornbeam hedge behind the third sculpture forms a spatial conclusion. A contrast to the symmetrical area is provided on a further parcel of land by a forest edge designed to resemble natural woodland. At its centre is a large area of lawn. Various events are held here during the summer months. The third area is a meadow orchard which was created in front of the agricultural hall. The trees were planted in accordance with Rückriem’s wishes on an imaginary grid system whose lines run at right angles to each other. Just as with the installation of the steles indoors, the trees were positioned in such a way that no two trees are ever standing on one transverse or longitudinal line. A development parallel to Rückriem’s already-known sculptural work can be seen here, whereby sculpture is accorded a lesser role and the surrounding area accorded greater importance. In some projects such as this one, the development is continued until it reaches a point at which the artist’s sculptural activity is finally transferred completely to landscape design. One reason for Ulrich Rückriem to choose Sinsteden was the opportunity which he was given by the district of Rhein-Kreis Neuss to design the buildings and outside areas, thus allowing him to put his ideas into practice without any major restrictions. 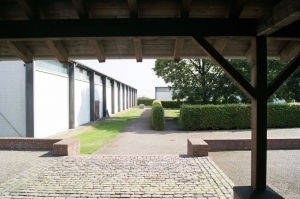 Far from the art worlds of Düsseldorf and Cologne and without having further artists in the direct vicinity, Rückriem was able to build exhibition rooms which suit him perfectly and to design the outside areas himself for the first time. But it is not just a question of the best possible presentation of his work, as he had already envisaged and desired many years previously. The location also provides him with a refuge where he can engage with his art and contemplate many new sculptures for the first time after they have been erected. Visitors who have known Rückriem for many years or who are confronted with his art for the first time can also gain a much better idea of his understanding of art here than anywhere else.